Cheryl likes to play with colour and her designs for mittens, tea cozies, and other sundries reflect this. The Annapolis area provides a myriad of ideas and her mittens feature waves, scallops, maple leaves, oak nuts as well as traditional thrum techniques. 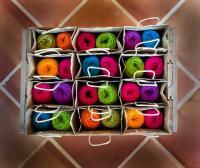 Knitters can select patterns and kits and everyone can enjoy the hand knit mitts.